I was watching TV last night when I saw this commercial & was stunned. It’s a commercial promoting High Fructose Corn Syrup. Here’s another one. 1. Cornstarch is treated with alpha-amylase to produce shorter chains of sugars called oligosaccharides. 2. Glucoamylase breaks the sugar chains down even further to yield the simple sugar glucose. 3. Xylose isomerase (aka glucose isomerase) converts glucose to a mixture of about 42% fructose and 50–52% glucose with some other sugars mixed in. What I find funny about this excerpt is that under the USDA guidelines, the Corn Refiner’s Association is allowed to call HFCS a "natural" product. 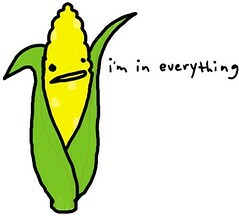 Does that process that the corn just went through appear as a "natural" process to you? No one really knows what the impact of HFCS has on the body. For some folks, I’m sure that the impact is more severe than others (as seems the case with everything; what is true for one may not be for another). For that reason, it’s difficult for anyone to prove that HFCS is the cause of the rise of obesity & diabetes since 1960, when it was garnering more use in processed foods; and processed foods were becoming more popular in American homes. What scientists have discovered is that HFCS seems to interrupt the signals that the hormone, leptin sends to the brain. Ghrelin tells the brain that we’re hungry – so we eat. When we eat foods with HFCS in them, they interrupt ghrelin’s counterpart hormone, leptin, that tells us that we’re full. As a result, we eat more of the foods with HFCS in them than we would a truly natural sweetener, like honey or refined table sugar. One of the commerical’s claims is also that it’s fine in moderation. That may be true – but how much is "moderation"? In my opinion, there may be times that I’m getting HFCS when I don’t know it, and that’s moderation enough for me. As a result, I don’t purchase foods that have HFCS in them. I am willing to send a message to food manufacturers that I don’t want processed crap and chemicals in my body. We as consumers have enormous purchasing power. We need to send the right messages to our suppliers: I don’t want your crap. ← Trick-or-Treat! Here’s a pencil….